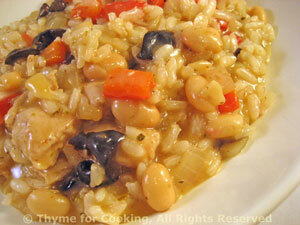 Risotto with Turkey, Peppers, White Beans, Thyme for Cooking easy gourmet. This is a colorful risotto with the red peppers and black olives. A few cannellini beans make it a complete meal. In medium saucepan heat butter over medium-high heat. Add onion and sauté until transparent then add rice and sauté stirring, for 2 - 3 minutes until rice has white center. Before the last 1/3 cup is added taste a few kernels of rice. They should be just 'al dente' - slightly resistant to the tooth but fully cooked. If more stock is needed add it 1 tbs at a time and waiting until almost completely absorbed. At this point risotto will be thick but not stiff - there will still be visible liquid and it will not hold it's shape on a plate. Cut the turkey into strips. Pit olives, if needed, and cut in half. Heat olive oil in nonstick skillet. Add onion and sauté 5 minutes. Add peppers and sauté 5 minutes longer. Add turkey and sauté until done, 7 - 9 minutes. Add olives, beans and stir to combine. Reduce heat and keep warm until needed for risotto.